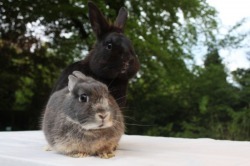 Stella is a small grey Netherland dwarf who used to share a hutch with her boyfriend Huey – as seen in this photo. Sadly Huey is no longer with us. Stella was born in May 2009 and has been with us since she was just 4 months old. She was unable to eat properly due to vastly overgrown front teeth (incisors) which were removed by our vets. We have to slice her vegetables very thinly but she has a good appetite and manages to eat everything.